For all of the eccentric and eclectic Porsche collectors and enthusiasts out there, we've decided that it is about time someone aggregated the best of the best that eBay has to offer in the Porsches-for-sale department. We've tracked down five exciting Porsches for folks to purchase today, including a slab-sided accordion bumper 911, a Porsche Limo, a super rare 964 Targa, a six-cylinder 'teener, and a rather inexpensive cup car winner. Some of these cars could be great collection investments, while others might prove to do more financial harm than good. Ah the unwanted and unloved mid-year 911s. After almost a decade of the long-hood 911s dominance, Porsche was forced to introduce the impact bumper cars. Concurrently, the cars also suffered power-reduction in the form of emissions regulations. With a castrated engine and heavier bumpers, the mid-year cars didn't offer nearly the same performance as the earlier cars. After 74, things got even worse when the "thermal reactors" were added. These cars are well known to have cylinder head stud 'pulling' issues. Put simply, they have never been much of a collectors car, but they're starting to get some attention. I have to say, though, that the visual appeal of these narrow bodied cars is starting to swing me their way. They have that classic Porsche look with just a slight flare over each fender opening. They have that slab-sided look that the earlier cars simply perfected. They eschew anything unnecessary on the exterior, including a passenger's side mirror. They're visually simple, in the best way. Good cars like this one still exist, and with the massively inflated price of the earlier cars (and, frankly the SC and 3.2 Carrera cars that followed), these mid-year cars are really gaining some momentum. This particular car is coated in one of my personal favorites, "Ice Green Metallic". When it's running properly, that CIS 2.7 liter engine is fantastic, both aurally and in the driving experience. While the reserve hasn't yet been met, this one should still go for a decent price. If you're really looking for something unique to add to your collection, or perhaps you're interested in starting a fledgling limo service business, then look no further. This Cayenne has its original 250 horsepower VW-sourced VR6, and what with it having been almost doubled in length and shod with flashy 22" wheels, you can bet that this Porsche isn't exactly quick. With the negatives out of the way, just take a look at some of the specs of this gorgeous limos. 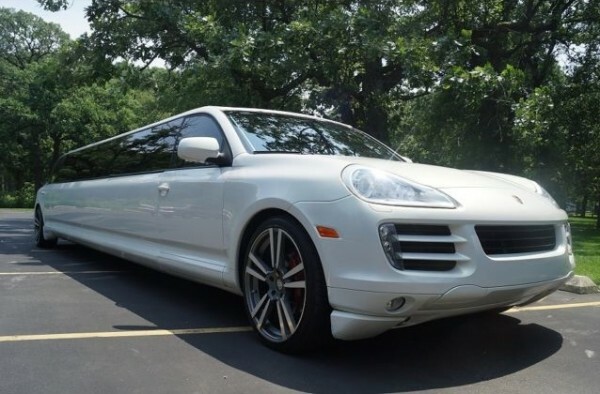 The Cayenne here has only had one owner, though we assume hundreds of passengers. It is said to have been smoke free, and no damage. These days, all of Porsche's Targa models are equipped with all-wheel drive, but for the 964 generation, it was an option that not many people opted for, with only 137 of them made across the 964 generation. This car was the last full removal top that you could get from Porsche until the 991 Targa was introduced this year, as the 993, 996, and 997 Targa models were essentially large sunroof models. If you want that wind-in-your-hair feel with the 964's muted good looks, this is the car that should be occupying your driveway. The asking price of only $16,500 seems like a bargain to me, even with it's cracked windshield and less than perfect paint. The car is described as a ten-footer, which isn't always a bad thing. To me, that just means you would be able to drive this car pretty much every day without feeling bad about it. Like the mid-year 911s, the 964 is also a historically unloved car, but they're starting to find their own in the market and I think that these have reached the bottom of their depreciation curve. You likely won't be able to find a half-decent runner 964 for this little money outlay soon. In fact, you could probably buy this car, house it over the winter, and make a tidy profit come spring-time when people actually want to buy open top sports cars. Whether to restore, drive, or flip for a dollar, it would be difficult to go wrong with this one. Early Porsche models are on fire in the market right now. They say a rising tide raises all ships, and the early 911's rapidly rising tide is bringing the 914, most notably the 914-6, up with it. This black car is particularly well presented, and the pictures do show a pretty 914 that is probably worth every penny of the buyer's asking Buy-It-Now price. There are a few downsides to this car if you were to want to keep it as a collector car. The two that present themselves immediately in the photos are a non-stock steering wheel, and the late-model digital audio head unit. These can be particularly expensive to rectify, as a refurbished steering wheel for one of these cars is easily hundreds of dollars. The head unit in itself isn't that difficult to replace, as the 914's radio was a DIN size with a metal face plate. You can replace the radio with a refurbished unit, and then install a new face plate. The really expensive part is what isn't shown. When people install an aftermarket radio, they often upgrade the speakers at the same time, which usually leads to owners modifying the door panels to fit these new speakers. Finding a good uncut door panel with no water damage is nearly impossible these days. If you're willing to rectify these issues, they would probably further increase the value of the car. Assuming it is a straight, rust-free car with a quality rebuilt running gear, a car like this could be reaching the 6-figure sums soon. If none of that convinces you, check out this video by the current owner. As used GT3 Cup cars go, it's harder to find one with this much provenance. This car has reportedly won three consecutive IMSA GT3 Cup Challenge Canada championships, winning the Gold championship in 2012 and 2013, then going on to clinch the Silver championship just this year, where it secured wins in 9 out of 10 events. The car is reported to never have suffered severe damage, with no crashes on record, and no tub damage to report. The engine was rebuilt at the beginning of the season (April, 2014), and has about 30 hours of running recorded thus far. The transaxle was similarly rebuilt, but a few months earlier, and has racked up an additional 15 hours of running. The car is said to be ready for top-flight competition in various club racing series throughout North America. There are a number of spares included with the purchase, including three sets of wheels four sets of slick tires, and one set of rain tires. The car is a few years old, but it is up to 2014 IMSA GT3 Cup spec for a Silver driver. As such, it has been equipped with the newer "Mechanical Blipper" (auto-blip downshift) sequential transmission controls. Who could argue with that beautiful chrome vinyl wrap? This thing just belongs in your race trailer for the 2015 season.